The Polyphonic Jump, our latest installation of media art, is now at Kobe Biennale. Polyphonic Jump is an apparatus for human beings to be immersed in a fantasy world where many creatures chorus in polyphony. Audiences stand in front of a huge canvas on which picture of forest is painted with oil, and jump for interacting with oil-painted animals on the canvas as if the audiences were also on the canvas. The audiences will feel they are actually in a picture book. 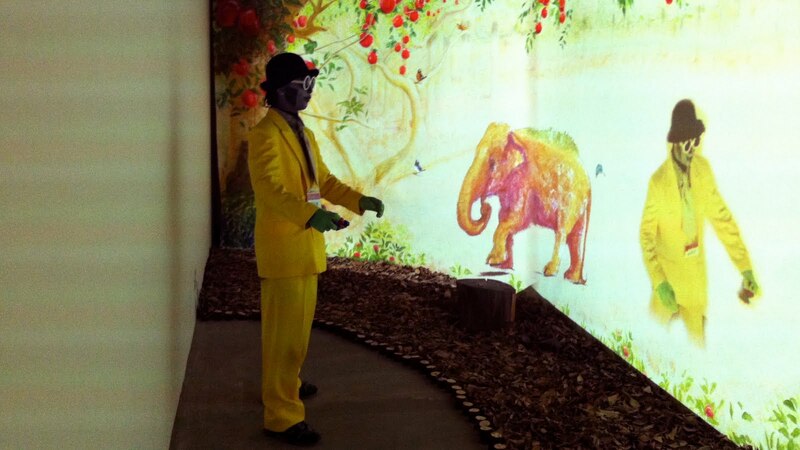 For seamless integration of physical painting which gives true reality and computer-generated animation which moves dynamically and interacts with audiences, the authors put real-time 3D modeling and projection technology in this artwork.